At a special meeting Oct. 16, Liberty Grove voters approved the purchase of three Gills Rock shoreline properties outlined in yellow. A full house turned out for Tuesday’s special Liberty Grove Town Board meeting, most of them there to say yes to the town’s proposal to purchase three properties on the Gills Rock shoreline for $1.45 million. The proposal passed by a vote of 111 – 19 via paper ballots. 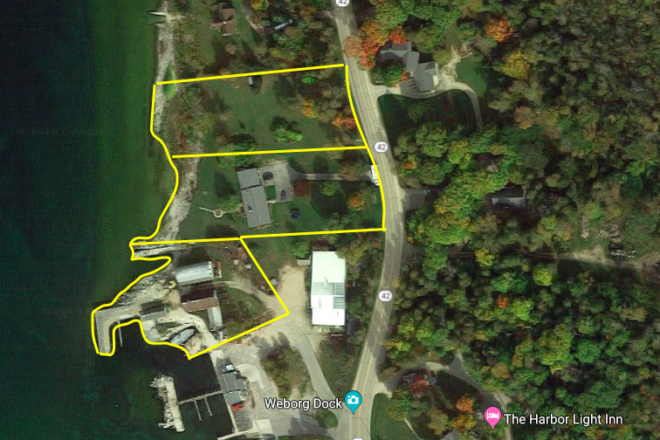 The stretch of 440 feet of shoreline is owned by three separate entities – Weborg Bros. Dock, Elizabeth Weborg, and the Richard Johnson family – and is assessed at a combined $1.6 million. Town Chairman John Lowry said the process began with a motion at the town’s annual meeting last spring, when a motion passed asking the board to investigate buying four shoreline parcels. The town approached the owners and entered into negotiations to purchase three of the properties. The town’s comprehensive plan calls for exploring purchasing shoreline property when it becomes available. He said a committee or task force will be formed to gather input, with hopes that proposals will be brought to the town next spring. He indicated that electors would get to vote on the future use of the property. Town Clerk Bud Kalms said the town has already begun investigating the potential for Stewardship Fund grants which could pay for up to 50 percent of the cost of the purchase. In a voice vote, town voters unanimously approved a levy limit override of $598,639.76 to pay for general operating costs and road work in the town. Kalms explained that due to state rules that cap levy increases at the value of net new construction, the town’s levy only increased by $17,154 for 2019. “With inflation, the cost of replacement parts, and fuel costs, we can’t keep up with expenses at that level,” Kalms said. Kalms said the cost of asphalt when he began his job as clerk was $35 a ton, but now it’s more than $100 a ton. “The levy limits are forcing governments and municipalities to borrow money to cover expenses, and when you do that you pay interest and it just costs you more,” he said. With the override, the town avoids cutting services or borrowing to maintain roads.